There are some notable projects out there striving to deliver digital transformation. It's pretty clear that the transformation journey will be long and bumpy. So I have been looking at new and exciting ways of enabling Transformation for Digital Service Providers. And I have been leaning on my experiences in my early career; when I'd decided to be an Astronaut! I have always been fascinated with the universe. I was wondering if it had an end and what would it look like. And so I decided to find out. Luck was on my side. I was in my early 20's, and the European Space Agency wanted astronauts. I knew I was very young. I was still in college, and I could drive a car, but I couldn't fly a plane, and doubtless, there were other skills I lacked too. But I had passion, and I just had to go for it. Sadly, it wasn’t to be. I was not selected. They thought I lacked experience. They were right of course, but I didn't want to accept it at the time. Just like the space-ship that I wanted to travel upon, my dreams came splashing down to earth. But this did not stop me, and I still planned to explore the universe. And so I became an Astrophysicist. I figured that to have experience; I would need knowledge and understanding. I earned my Ph.D. and became a Doctor of Astrophysics. To do that, I had to become a master of data; lots and lots of data. I hear people talk about 'Big Data,' but seriously when it comes to Astrophysics data isn't big, its MASSIVE. There are several dozen large telescopes around the world. Just one of these telescopes requires a supercomputer rated at 100 petaflops. That is one hundred, thousand, million, million calculations per second. I think we can agree that when it gets to BIG data, it doesn't get any bigger than Astrophysics (not yet) because the universe is so immense. And yet, despite all those stars, the universe is mostly empty. It is, after all - space! To measure distances, we talk in light years (the distance that light travels in a year). 1 Lightyear is a 9.5 Trillion km. At that speed, the light from the sun takes about 8 1/2 minutes to reach us. So what we see (if we were foolish enough to look at the sun) is the image of the sun, not as it is now, but how it was 8 ½ minutes ago. And when we look into the night sky, we are not seeing things how they are but how they were in the past - a long time in the past. The stars we can see might not even exist anymore. Their light might have been traveling for billions of years before it reached us. Just think how far away they must be. And yet, if we could follow their light trail backwards. If we could go to that light source right now; would not find a single one of those billions of stars. Because we are not only seeing stars how they looked many years ago but also seeing where they were many years ago. And they won't be there now, and not because of their orbit. They won't be there because when they sent out that light beam, the universe was smaller than it is now. Everywhere we look the universe is expanding; fast. Distant galaxies are getting ever more distant. But what does this have to do with enabling Digital Service Providers and their epic journey called digital transformation? Well, I'll get to that. I promise! But first, back to that endless data. On January 7, 1610, Galileo pointed a small telescope at Jupiter. What he observed changed how we understand the universe .. and it lead directly to new innovations. Galileo noticed what appeared to be four small "stars" near Jupiter. Over the next few weeks, he watched the faint "stars." They followed a pattern as they moved the sky, always keeping close to Jupiter. Galileo was able to provide this last missing piece of the puzzle, and he gave visual confirmation that in fact, the earth is not center of everything. This enabled an entirely new view and use of the collected data. Galileo was able to pass on that understanding too. Using the absolute precision of the movement of Jupiter's moons and their moon phases lead directly to more accurate timekeeping and more accurate maps. “Hang on! !”, you might say, “Hollywood has found a way”. We’ve all seen movies where spaceships travel to distant galaxies in the blink of an eye. Wouldn’t it be an exciting if Hollywood was proven to be right? And big screen imagination may yet become reality because there is a concept called 'wormholes' and it works like this. Imagine our universe is printed on a sheet of paper. You could draw routes and measure between each place. You could plot a journey from Earth to a distant star Vega. Even when the paper is bent the universe retains its form, the routes and distances are the same. Even if you fold the paper the same is true. But if we fold the paper and push a pencil from one place to another we connect one side of the universe to the other. This hole is a wormhole. So If we were somewhere up on the top of the sheet (Earth) and we wanted to go Vega on the bottom, we have two options. We could go the long way around following the route we charted or we could use the wormhole as a shortcut. 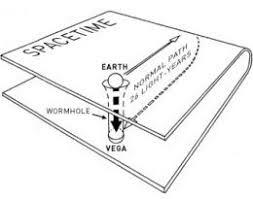 A wormhole is a passage through space-time between two places, maybe even two separate universes. If we could find and travel through wormholes, then we might travel like they do in movies. In small craft, at astonishing speed. Never traveling faster than light. But getting further than light can travel at the same time. Wormholes may be theoretical today, but just think if we could use them. They would be like our super highways through the universe. But first we’d have to know what to look for and we don’t know what a wormhole really looks like. We don’t even know how to distinguish a Wormhole from its big bad relative a Black Hole! Visualising the difference between a Wormhole and a Black Hole could become our essential navigation tool to enable real space exploration. Well, Digital Transformation is a major journey. Moving your business from CSP to DSP is not unlike moving to a new planet. Huge resources are used just to plan the journey. When the changes actually start, they are expected to take a long time and it will be a be a bumpy ride! 84%1 of Digital Transformations fail to reach a satisfactory outcome. Some transformation projects will get part of the way, and others will be lost on the journey. These are not good odds - but it’s about survival, right? Everyone wants to survive, and thrive. All of the Telecoms providers of today are making their move, or planning set off very soon. It is about survival and everyone has to transform. And the thought occurred to me, "what if someone found a Transformation Wormhole"? A way to zoom ahead with transformation. Not spending time planning, spending it moving. What would a transformation wormhole look like, and how could we create it? THAT is the central question I am now involved in solving. I am no longer an Astrophysicist, I am head of research for a software company called, interestingly, Galileo Software. Our customers are all CSPs like you, and we are creating tools to help them on their transformation journey. We believe that Visualising data is key to accelerating transformation. Visualising data so that, like Galileo himself, you can see the full picture and use insights to innovate and advance. Using visualisation to engage, explain and communicate what's happening to others in your teams and wider organisation. Dr Andrea Reichstein, has a real passion for her topics. While she once studied the countless millions of celestial bodies, she is now focused on the countless billions of (pieces of) data that exists to monitor the customer experience of mobile-data consumers. She’s convinced that DSP’s need to up their game to create the right levels of Customer experience for the 21st century and to embrace the importance of Service Relationship Management. She is working to create new tools to model and manage it in a complex and changing environment.